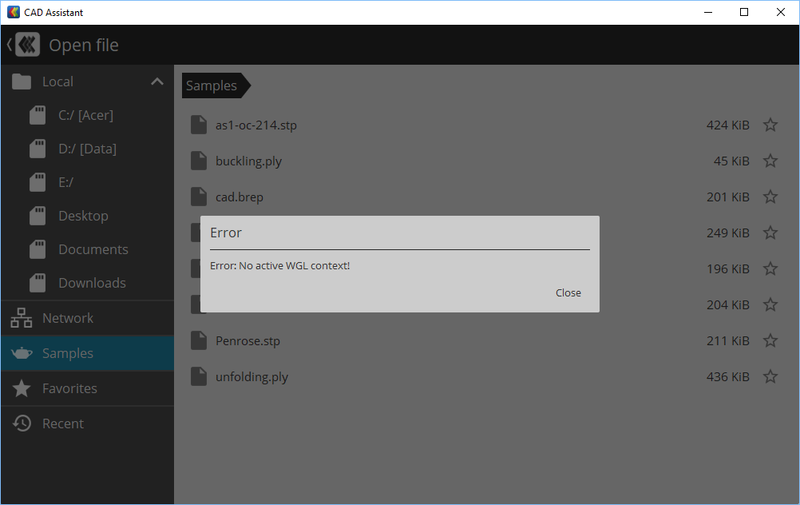 CAD Assistant "Error: No active WGL context!" I installed the CAD Assistant today. Immediately after the installation it gave the "Error: No active WGL context!" at start, please see the screenshot attached. There is no way to "close" the error window. I have never seen this error before. I would say this is some trouble with OpenGL drivers installed in system, but in this case there should also issues in User Interface - which is drawn correctly as far as I can see on screenshot. Could you please provide some details about your software/hardware configuration and if you have been able using previous versions of CAD Assistant? I've never tried the CAD Assistant before. CAD/CAMs (Autodesk Inventor, ANSYS workbench, ...) run smoothly. The CAD Assistant download page has been extended with a list of previous releases. It would be useful if you check if previous release 0.9 has the same issue, or this is a new problem. Sorry, I didn't find how to choose the release to download. There is a spoiler "Previous releases" right after the list of main downloading list on the page. If I run CADAssistant.exe as administrator, I have no that strange error. CAD Assistant version 0.9 runs without errors.